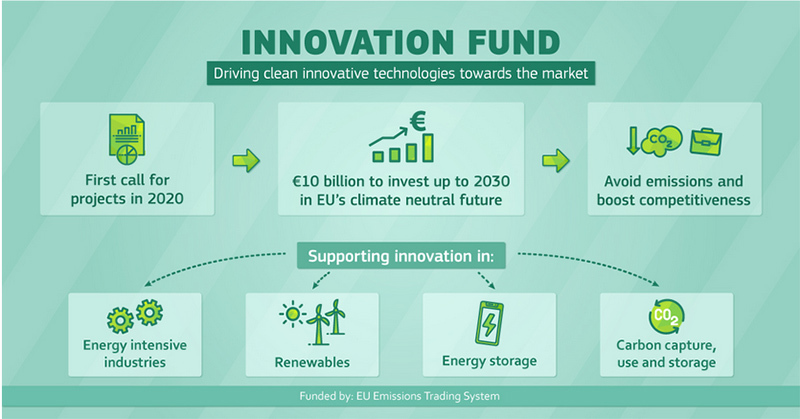 On 26 February 2019, the European Commission announced the creation of a new investment programme for low-carbon technologies: the ETS Innovation Fund. The fund is established by the EU Emission Trading System (EU ETS) Directive and will run from 2021 to 2030. It is endowed with at least 450 million allowances, which could amount to around €10 billion depending on the carbon price. The ETS Innovation Fund is the successor of the NER300 programme, and as such it will also pool together any undisbursed revenues from that programme. It will be one of the key funding instruments for delivering the EU’s commitments under the Paris Agreement and help bridge the so-called “valley-of-death” of innovation funding. There will also be close synergies with other EU funding programmes such as Horizon Europe, InvestEU and the Connecting Europe Facility. The first call for proposals under the new Innovation Fund will be launched in 2020, followed by regular calls until 2030. The application process will contain 2 steps. First an expression of interest and then a full application. The Innovation Fund aims to create financial incentives for companies and public authorities to invest in the next generation of low-carbon technologies and to give EU companies a first-mover advantage to become global technology leaders. It will offer funding to more mature projects with a big innovation and industrialisation potential. The Innovation Fund will support investments in renewable energy, energy storage, carbon capture storage and use, and decarbonisation of energy intensive industries. Regarding wind energy the Innovation Fund explicitly aims to support the development of floating offshore wind farms and next generation wind turbines. The Innovation Fund will mostly work with grants. Grants will be disbursed in a flexible way based on project needs, taking into account the milestones achieved during the project lifetime. Projects can get 60% of the additional capital and operational costs linked to the innovation reimbursed via grants. Up to 40% of this grant can be given based on pre-defined milestones, such as reaching financial close, and before the whole project is fully up and running.